So as this evening’s title so clearly states, I am going to be posting a Throwback Thursday. I am sure everyone is aware of what Throwback Thursday consists of; I will be sticking to the tradition of any other #tbt but I think I’m going to be keep it Literature themed. Who doesn’t love a little childhood nostalgia? Ever since I was a little girl, I’ve always been interested in literature, my first favourite book, that I actually learned to read was by Jill Murphy, and it was called Whatever Next! The synopsis is about a little bear who dreams of flying to the moon. He asks his mother if he can go, but his mother tells him no because it’s bath time. Of course with childhood imagination, anything is possible, and this little bear makes a space rocket out of household utensils, he grabs a few snacks for the flight and off up the chimney he goes. He meets an Owl and off to the moon they flight. 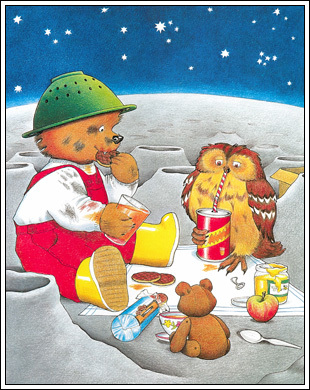 They enjoy digestive biscuits and soda on the moon and a long flight home, all before bath time! This little story is a beautiful tale of imagination and childhood innocence, a tale that I am extremely emotionally attached to. Of course, childhood stories will always bring out some childhood nostalgia, but for me, it’s a little bit more. I learned to read Whatever Next! by having it read to me before bed, every night by my father. Sadly, he passed away when I was eight years old, so whenever I reminisce about this beautiful little story, it also takes me back to a world where life was so simple and sweet. My copy of this particular book is actually in pieces, the cover has been ripped off, and the rest of the pages are torn and creased – it’s twenty three years old, and it was attacked by my dog when I was thirteen. But it’s still perfect. A few years ago, I specifically ordered a copy of this book to my local Waterstones. I bought a brand new version because I want to keep the memory of Baby Bear, and the sweet memories of my father reading to me, alive. I am planning on reading this particular book to my own children, and maybe they can pass it on to theirs. Whenever Next! is my favourite childhood story, it’s an extremely emotional connection to my past, but it also reminds me that dreams can come true; imagination is something you should never lose, which is why you’re also never to old for Disney! I like literature, pugs and people but mostly food and my cats 😻 Happy blogging.